Another comic origins of Derpy’s cutie mark, this time its the Cutie Mark Crusaders looking to get their own. This is from BronyComm, the aussies who are slowly doing commentary to the videos. Also fun to see they quoted one line from my news when they originally hit the scene. Haha, I made a comment on their page more or less saying “aussie, that’s what those accents are.” and they replied with . Fair enough guys, I get mistaken for being Canadian, even by people in my own state. Also, if you didn’t catch the news on EqD, they now have episodes 5 & 6 posted, embedded for your viewing pleasure below. And last, a message from them about what might go on after the season ends, and they finish commenting on all the episodes. Slow news day is slow, but I guess its probably a combo of good weather and spring, ponies doing their winter wrap up (mfw my snowmobiles are still in the yard, surrounded by green grass) and off doing god knows what. I know the IRC channel I dwell in has been quiet. So videos you’ve probably already seen. This is a 42 minute video of the first two episodes dubbed with Pink Floyd’s Animals album. I haven’t given it a go, but its probably interesting. Heh, kind of like listening to Dark Side of the Moon with The Wizard of Oz, never tried that either. Actually ponies brought me to this song, well the Myon version that seems to go around. As the description says, it just had to be done. Well, not really news, but if for some reason you’re looking to read just this news section (which now uses blogspot) we do have a domain for it for easier linking. That’s all for now, Happy Easter everypony! Question for you, what would easter by like in Equestria, if they actually had the holiday, but you know, the whole bunny bringing you candy and such, not nailing someone to a pair of boards because he threatened the Romans. Freshly encoded and released by Mentos and TrollHD, Episode 12, Call of the Cutie in delicious 1080 and 720p. As said in the review, there’s the possibility we’ll get at least one more if TrollHD records the pony marathon tomorrow on the hub. Well, I’ve been given an address for a 720p version of Owl’s Well that Ends Well, I think its the itunes version which means no watermarks, but its a new source that has all the episodes in 720p. Someone do me the favor and alert me if there is something fishy about these files, its a new source and I don’t download the HD versions cause my internets are not the best, so if someone who does download this, give it a scan and let us know. TrollHD which is the source of the raw HDs that Mentos encodes and uploads for us, doesn’t seem to be recording them on Friday anymore. The new episode does air several times over the weekend, Saturday @ 9:30am and again on Monday @ 1:30pm, so they are probably grabbing the rips during one of those viewings now. Seems someone is mixing lyrics into EuroBeatBrony’s work, and when I say lyrics, I mean the actual vocals from the show. When someone showed me this, I thought they meant someone random singing, but here is Fluttershy, giving you a heart attack with her love of nature. Well since I got the ability to post up images easier with the blogger, you’ll be seeing more Derpy related material up here, first..
All my money, TAKE IT, these are so cute. You can check out Meghan’s dA Spirit of America. 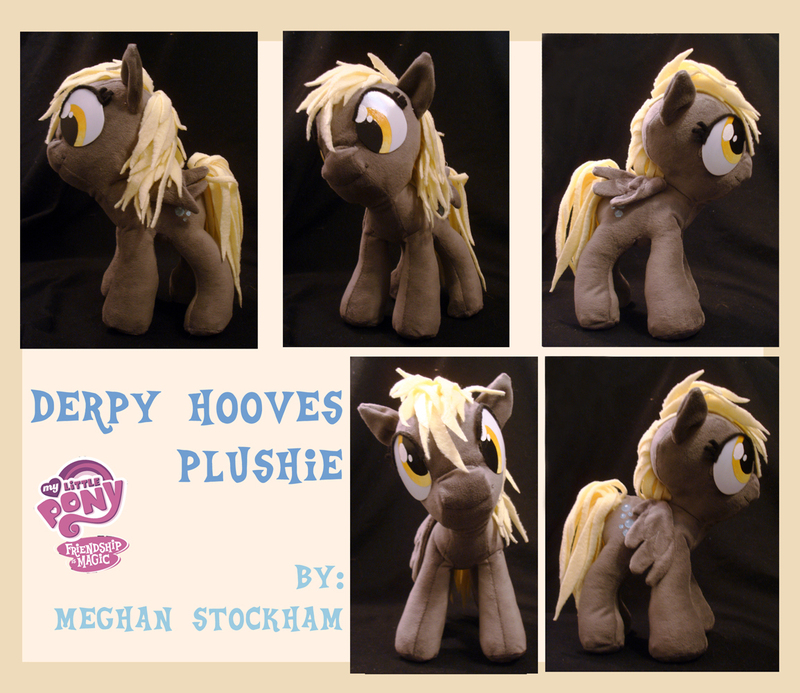 She has also done an Applejack Plushie found here. She’s currently not taking commissions, so you’ll have to wait for the Derpy. 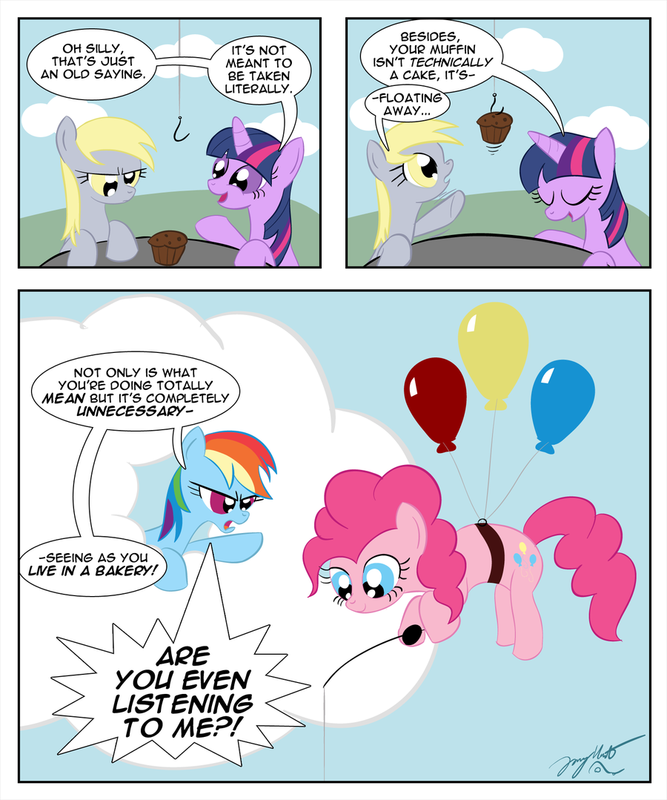 Random comic with Derpy, and Pinkie Pie stealing her muffin. Love her face on the first panel, I was going to crop her out and say she was attempting to move the muffin with her mind, like Silent Bob in Mall Rats. (Edit / Update) It was pointed out over in EqD when the bottom comic hit, that its a follow up to the comic that is now above it.